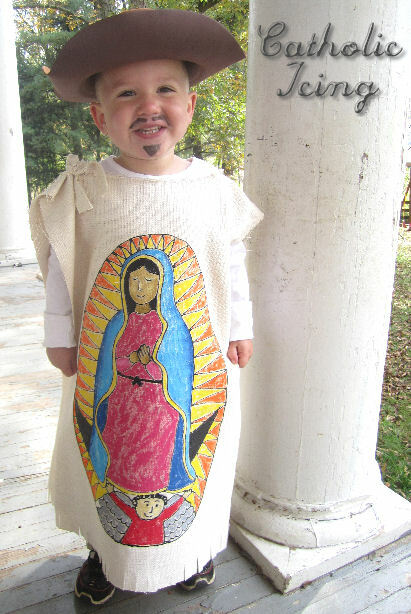 When it was time to pick saints for All Saints’ Day costumes, there was no doubt who my 3 year old wanted to be- Saint Juan Diego! He absolutely adores the movie Juan Diego, Messenger of Guadalupe. I don’t love all of the CCC movies, but this is one of my favorites! It’s so sweet, I like the animator they used for this movie, and it actually made me cry the first time I watched it. You can buy the movie here, or you can rent it from Pius media. 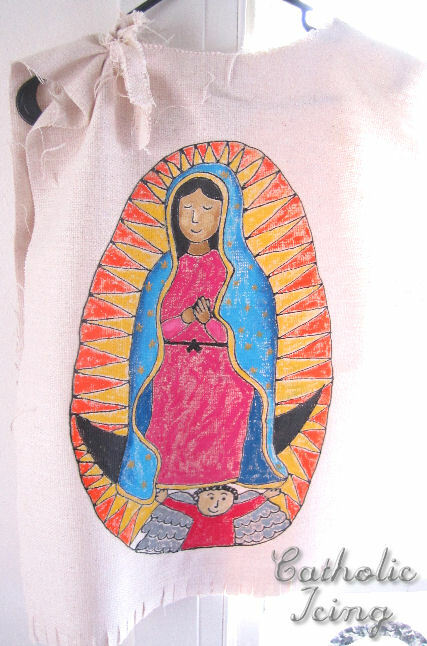 The real challenge to being San Juan Diego for All Saints’ Day is creating a tilma with an image of Our Lady of Guadalupe on it. You can make a simple tilma from paper bags, or you can get more complicated with it. 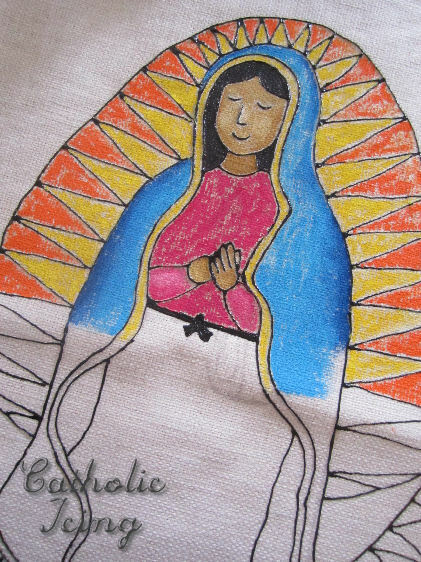 I was thinking about printing an image of Our Lady of Guadalupe on iron transfer paper, and ironing it onto a make-shift tilma. Ultimately, I decided to paint it on myself! I started by folding the fabric in half, and cutting a head hole in the top. Trim your timla to be the size you need for your particular child. 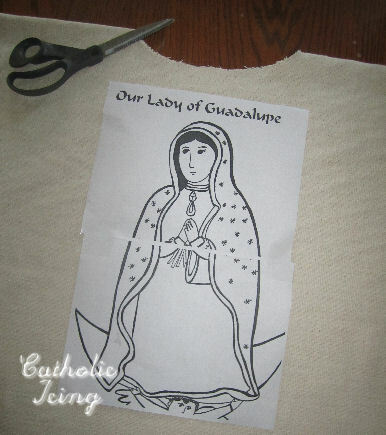 Next, I printed the Our Lady of Guadalupe coloring page the right size I needed for my tilma. 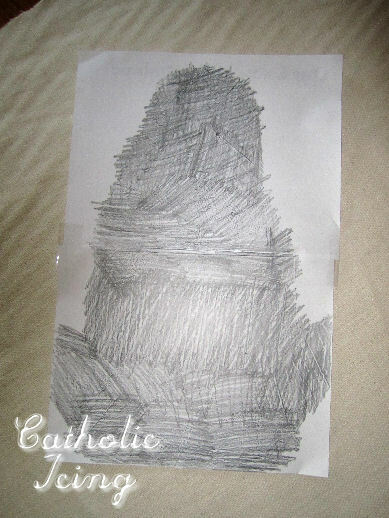 To transfer the image, darken the back of the print-out with the side of a pencil. 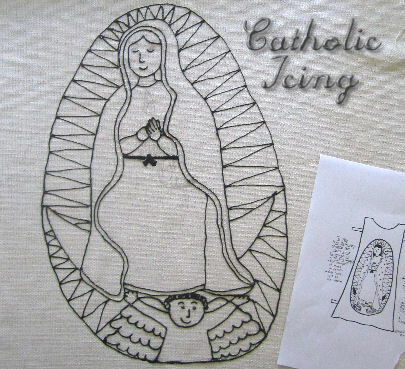 Tape the picture onto the fabric in place, and trace (with plenty of pressure) over all the lines. 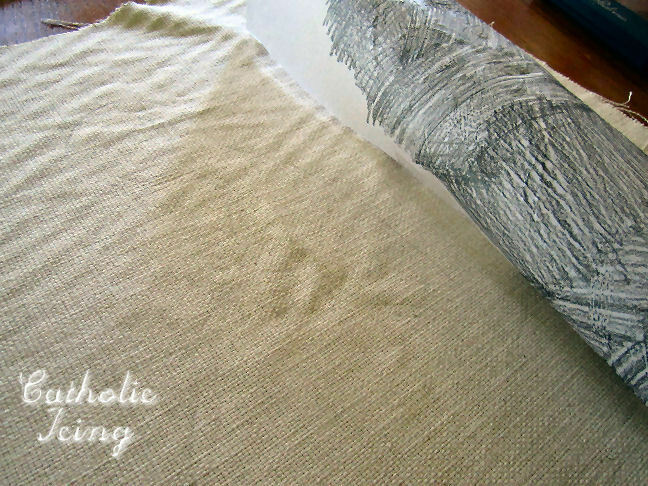 This will impress a faint pencil drawing on the fabric. I had trouble getting a good picture of this. 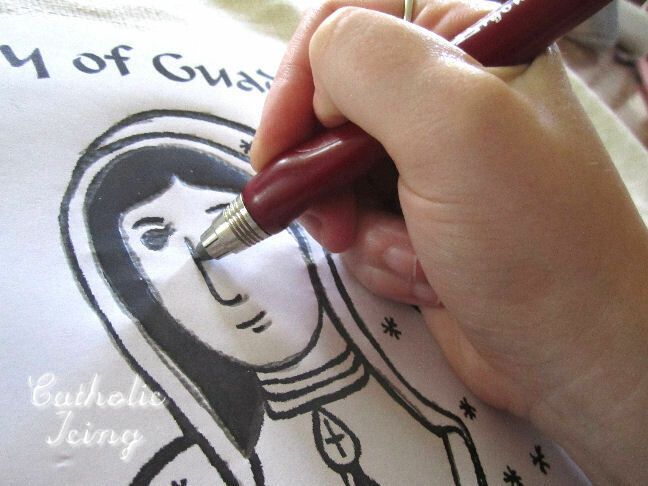 Trace over your pencil impression to darken it. Now you’re ready for the fun part! 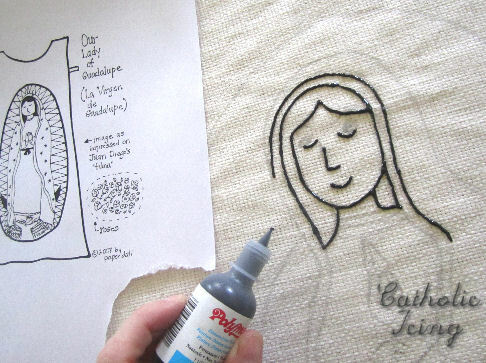 Go around all of your pencil lines with black fabric paint. 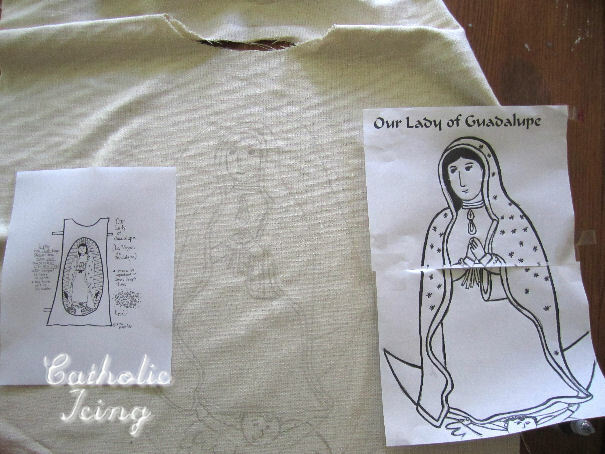 Let your outline dry overnight. 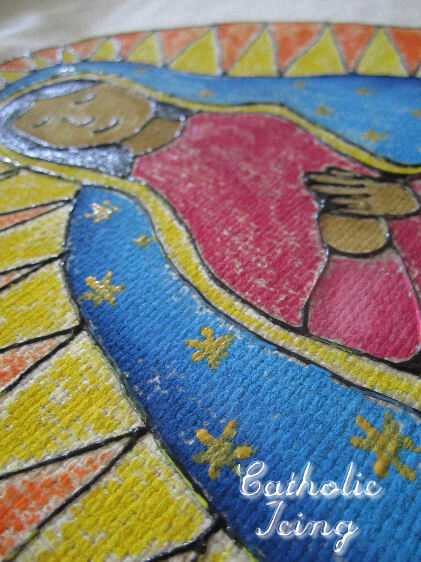 Once your outline is dry, paint the sections in with acrylic craft paint. I used the cheap Apple Barrel paints. I had fun painting this in! I did a little bit of shading, but you wouldn’t have to. Don’t let this project scare you- if you can paint inside of lines you can do this! 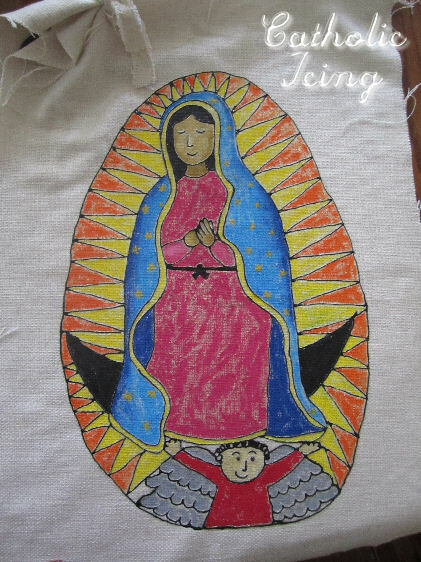 The last thing I painted on was the stars on Mary’s veil. I took a strip of leftover fabric one one of the tilma shoulders to make it look more like the tilma from the movie. Have your child wear some neutral colored pants and a shirt. Put the tilma over their head. Paint on a little mustache and goatee with some face paint, and add a sombrero-type-cowboy-hat. I wanted to share my son’s St. Juan Diego costume with you, as you were a great inspiration for it… let me know if I can email you!! Thanks for sharing, I’m so excited as a local parish has an All Saint’s Day Mass on Hallow’s Eve and then a procession through their cemetary…this is our first year going, and we’re really excited to have a great saint costume for our little guy! You are truly a gifted individual! I so enjoy receiving your emails to see what you planned for the season, month, feast day, holiday, etc. You are so entertaining as well as talented and energetic. I also use many of your ideas! Keep them coming please! 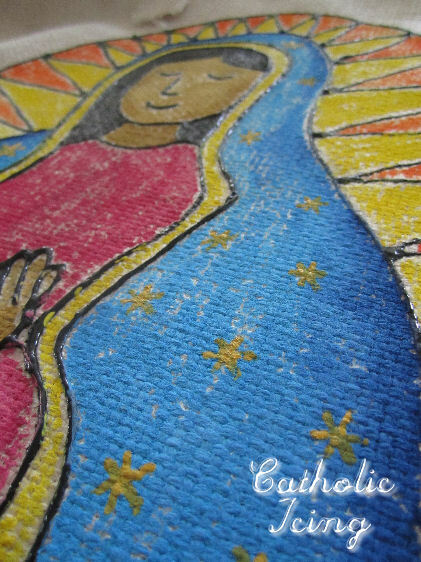 Takes the planning off my shoulders as a 5th year catechist in this parish.